Dave let me stay in his spare room while I worked on editing his healthy eating guidelines. In the beginning we shopped and ate together, so I got to know him quite well. Aside from everything he had going on on the outside, his mind was as active as his workouts and his heart matched his big personality. His wall-to-wall cupboards were suffocating from post-it notes, and on the days he worked from home, silence just wasn’t an option. It was difficult to judge which was louder – his morning/showering music, or his inside speaking voice when excited. Both reverberated throughout the small apartment, regularly breaking my concentration. It was as if he plugged himself into a speaker while Skyping clients and mentors, each sentence ending in a laugh or positive remark not even two sets of doors could contain. He worked feverishly on developing his brand and liked to think aloud and talk through his big ideas. He reminded me of a big slobbery puppy—I’d be working away on my laptop—then without warning, he’d barrel into the room and prod me with his words until he had my full attention. At times I found it frustrating, but in hindsight I’m glad I took the time to listen. Dave and I were the same age (27 at the time), so I was both surprised and sceptical when he gave me life advice with great assertiveness. Some of his suggestions seemed harsh and unreasonable; at times I thought “how dare he, he doesn’t know me.” I was irritated by how sure he was of himself. If I didn’t agree, I so badly wanted to prove him wrong. I think his confidence irked me because I wanted to be that sure of something. 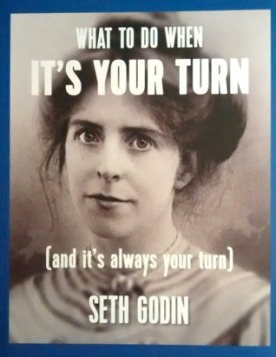 Dave lent me a book he sent to all his major clients called What To Do When It’s Your Turn By Seth Godin. He said it changed his life, which I thought was an exaggerated claim to make. I screwed up my face in front of him as I flicked through the pages. The alternating fonts and text placement made me cringe and the writing style seemed clunky. I agreed to have a read out of politeness, but I planned to do so half-heartedly. By about page 10 I was hooked. I stopped focusing on Godin’s style and began pondering his simple, yet potent messages. The words and images stunned me like a ray gun; one page could snap me into a contemplation coma for days. You’ll have to read it for yourself to fully comprehend its truths, and how you can apply each nugget of wisdom to your life, but the extended title (bracketed) on the cover is what really shook me; What To Do When It’s Your Turn (and it’s always your turn). I recognise one of my biggest personal downfalls as being hyper-critical of myself. Sometimes my harshest thoughts leave my brain crippled and incapable of pursuing things I’m most passionate about (in such moments I need Dave around to shout POW!) It may seem like I put myself out there, but unbeknown to most, I heavily vet my creations, ideas and opinions in fear of judgement. I’m rarely proud of the work I produce, which makes it difficult to publish. It takes the approval of others before I ease up on myself, however, one negative remark has the potential to leave an oily stain on my mind. 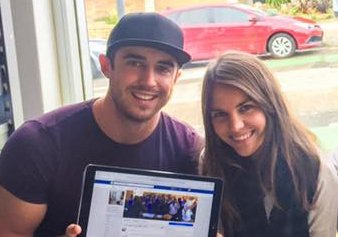 Godin’s musings helped normalise this feeling and put some much needed wind back in my sails. Almost a decade ago, I wrote and illustrated a children’s book for a TAFE assignment. I called it Noonie and the Missing Bone. It was a fictional story based on my pet dog and cat, incorporating various aspects of my everyday life. I hardly remember creating it, but I know it was well received among my peers and achieved top marks. When I got it back, I had Officeworks turn it into a hard-cover book, thinking it would serve as a quirky relic when my pets eventually passed away. When I went on to study primary teaching, I used it as a resource to prompt creative writing. Each session, I noticed the positive impact it had on students who were usually most reluctant to write or draw. On my last set of teaching rounds, one student was so inspired, he produced his own rhyming story at home and brought it in to share with the class. His face beamed as his peers commented on his adorable drawings of the main character, a bear on a bicycle. I often wonder whether he thought to keep it. Friends and family who read my story encouraged me to seek out a publisher, but deep down the drive wasn’t there because I didn’t whole-heartedly believe it would be accepted. It wasn’t that I thought their praise was insincere—I just put it down to how much they admired my enthusiasm and personal flair. When the book’s binding began to split, I contemplated whether to get it reprinted, or take it as a sign the story had run its course. When I moved to Japan, I packed the book alongside a Tupperware container of shells and my vintage Scrabble set. I sent the box back to Mum’s in Melbourne and that’s where it stayed. I kept Godin’s book on my night stand back in Sydney; its ugly cover taunted me each morning as I reached for my phone. 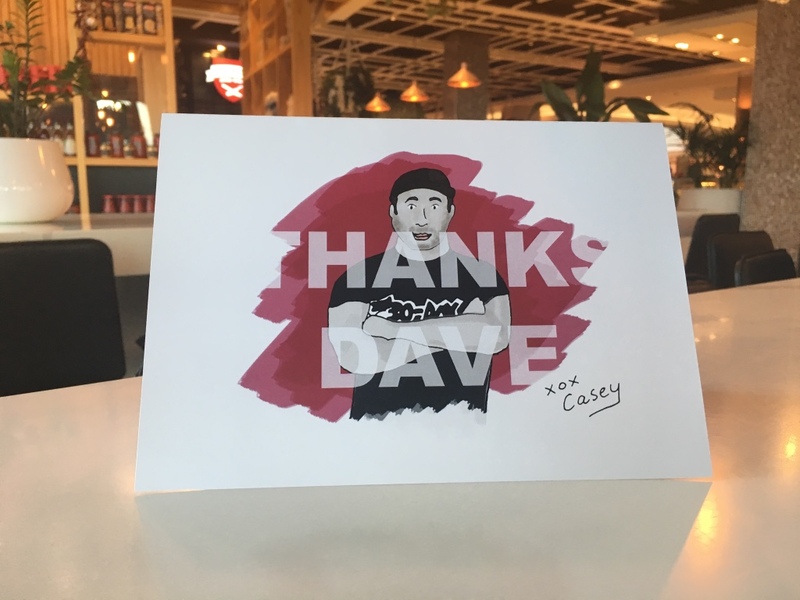 Dave’s positivity was leaching into my brain and most of my waking hours involved writing, drinking good coffee, listening to upbeat music and being surrounded by the beautiful people of Bondi. I felt inspired by the bare-chested/crop-top wearing joggers. 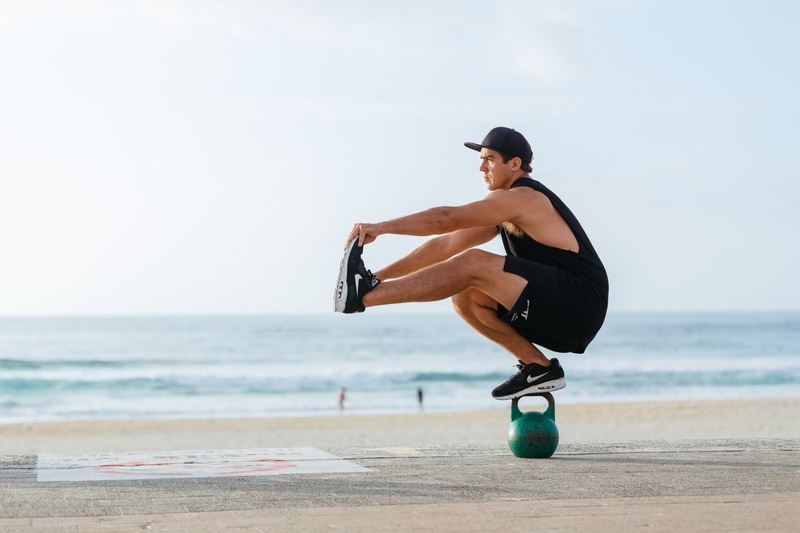 The girls running down Bondi Road reminded me of little billy goats, weaving between slow moving boulders (I was usually one of them—a boulder that is). I felt drunk inside the Bondi Bubble—on an obscure cocktail of motivation, insecurity, jealousy, optimism, curiosity and Dave’s bloody morning music. Perhaps that’s why I can’t recall the exact moment I decided to self-publish my book. All I know is it was swift and uncalculated. I posted an advert in the IT section of Airtasker, asking if anyone was willing to incorporate an ebook widget on my webpage for $150. I accepted one of the first offers made before I convinced myself it was a silly idea. Within a week, I was announcing on Facebook my ebook was available for download. Of course Mum was my first customer. I received positive feedback from supportive friends who purchased the book, but none of which had children. More than anything, I want young people to recognise they all have a creative story like mine within them, but often it’s covered up with self-doubt and anxiety perpetuated by unwarranted criticism. I was one of those students who received mediocre marks in English, and they sat with me for years after I graduated. I’m so keen to set the record straight on what good writing entails and how it can be achieved, I’m dedicating my time to facilitate writing workshops in schools across Australia. To help me promote the program, I contacted the nationally acclaimed education organisation, Australian Scholarship Group (ASG). As they work with thousands of families, schools and teachers around Australia, I knew they’d have the channels to get the word out. I was equal parts nervous and ecstatic when they agreed to meet with me. After the ASG team heard my intentions for the book and school workshops, they wanted to support me as best they could. They offered to publish my book and become official partners of the writing program. I’ve known for some time now, but have kept the news under wraps whilst Noonie was receiving a spruce up. We transformed his look with the addition of an eye patch, making him look even more a-dor-ARGGGG-ble and cover ready. Thanks to ASG, he now features on the front of a commercially printed and bound soft cover book with colour-in pages, available for purchase on my website. I couldn’t be happier with the way things have turned out. 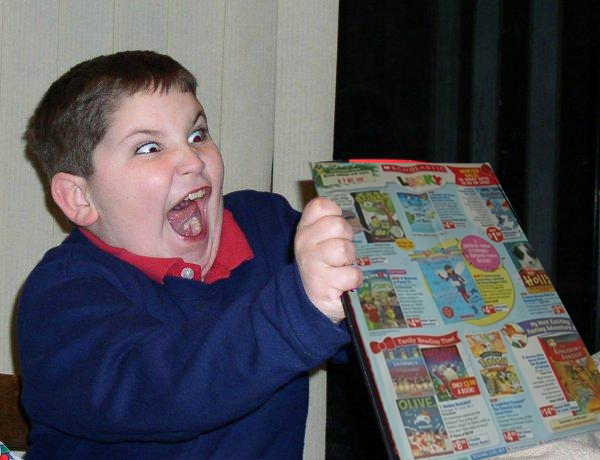 When I found out my book will feature in Scholastic Book Club, I giggled uncontrollable from excitement (80s/90s kids will surely understand). I want to point out something I wish I knew years ago. I’m not sure if what I’m about to say will stir something within you or even make sense, but if it inspires or changes the perception of even one person, I’ll be glad I did. It may be a concept no one can really grasp until they experience it for themselves, but here goes. Before I became a published author, I thought published authors were shiner versions of myself. I thought they must be more intelligent, more creative and likable than the rest. As far as I’m aware, I haven’t developed those traits overnight. In fact, I wrote my book 10 years ago, so what does that say about my development one decade on? Some may claim it’s easier to get “discovered” in the digital era. Others will put it down to luck. Do you think my story would’ve been just as publishable 10 years ago when I submitted it to my TAFE teacher? Think about what that means to you. We all have the capacity to produce work worthy of “the pool room” (as Darryl Kerrigan would say). Just because it doesn’t make it onto the world stage doesn’t mean it’s unworthy. Take my book for example, if it weren’t for Dave and his crazy POW mantra, the printed copy probably would have sat pinned up against the burgundy Scrabble box until the next time I found myself stuck at Mum’s on a rainy day (maybe not so long considering she’s in Melbourne). Just in case you’ve missed the message, I’m going to take cue from Godin and get real blunt: you’ve probably got your own Noonie equivalent (not necessarily a book or piece of writing) stashed away in your wardrobe amongst your own meaningful bits of clutter (AKA my shell collection and vintage Scrabble set). My next few blog posts will be dedicated to those whose names feature on the dedication page of Noonie and the Missing Bone. So many fantastic, inspirational people have come in and out of my life, making it mighty hard to single out individuals. I decided to share the story about Dave first because although our time together was brief, his actions implicated mine, and without him the next 12 months would look very different. 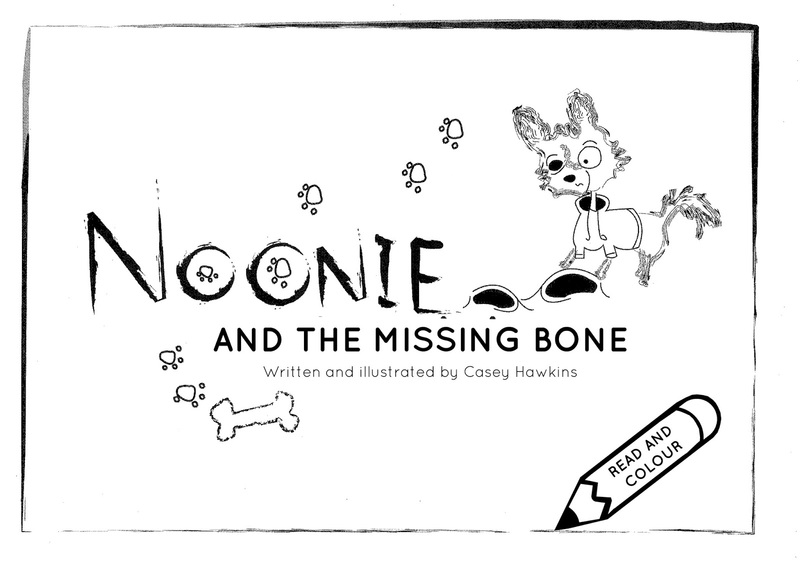 The new and improved front cover of Noonie and the Missing Bone. If you would like to purchase a copy of Noonie and the Missing Bone, you can click here to be redirected to the online store.